This is a nice, clean spiral ratchet screwdriver, it is marked "MILLERS FALLS GREENFIELD MASS. MADE IN U.S.A. NO. 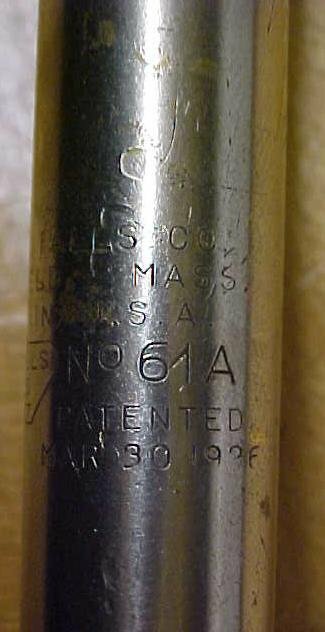 61A PATENTED MARCH 30, 1926" on the nickel plated area between the hand and the selector switch. It measures 17" long overall extended without the bit, has a rosewood stained hardwood handle. The wood handle is solid with about 90% of it's original finish intact, including the original black, gold, and red label on the handle. The finish on the handle is still well attached, but show an alligator like texture or grain in the finish as seen in the pictures. The hardwood has only minor wear and dings as shown in the pictures. The steel screwdriver head and shaft is in good usable condition with very little wear. Nickel plating is over 90% intact with some minor scratches. The selector on this one moves smoothly and holds position very well, three position, left, right, lock. The spiral function is not spring loaded (or rapid return) on this one, and can be locked in the compressed position, and used as a ratchet, or standard screwdriver,. 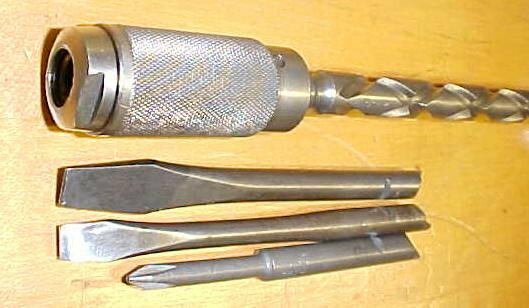 The bits are removable, and has a 9/32" or .280" diameter shank, 3 bits or removable tip are included, 2 slot bits and one Philips (No. 1 size). The spring type chuck, ratchet and spiral system are all in very good working order. It accepts the 9/32" size Yankee Phillips adapter bits that we also offer for sale separately at this website, (under Yankee with the search feature). A very nice larger sized spiral ratcheting screwdriver! Items Similar To "Millers Falls Yankee Ratchet Screwdriver 61A"